The enigmatic smile is one of my best GM tools. When my players start asking questions I don’t have answers for, I just lean back and smile. Then they start tossing the question amongst themselves, and usually they come up with a pretty good answer that I can use. When they discover that their hypothesis is close to the truth, they feel clever. Everyone wins. As a GM, I am forever beset by the need to answer the question “What next? What next for our heroes?” The players and their characters have to be the focus of every scene, every moment. My real job, my top priority, is to engineer thrilling confrontations for the players so that their heroes can do big exciting heroic things. Sorting out every answer to every question is much further down the list. Because my heroes ARE my audience, I never have to reveal anything they can’t see for themselves. So when they ask, “How come this dead bad guy didn’t even use this magic fireball wand,” I don’t have to have an answer. They don’t ever have to find out. In fact, I have learned that if I just lean back with that enigmatic smile and say, “Yes, indeed, why DIDN’T he?” my players will run with that ball through the endzone and right on out of the stadium. This is still kind of a hard lesson for me. In a story, I can’t leave big mysteries lying around for my audience to solve for me. I have to provide those solutions for them. The enigmatic smile. Works every time. Works in a game, anyway. It didn’t even occur to me that it was a hole in the story, because in GM-head it sets up the requisite thrilling confrontation. But of course in a story, the reader gets to that moment and asks the same question, and I can’t lean back. They can’t see my enigmatic smile, and if they do hear me ask “Why indeed?” they’re just going to throw the book against the wall. I spent days agonizing over this after my early reader pointed it out (always have an early reader to catch this stuff for you). How could I fix this? Could I somehow explain that the fireball wand needed special circumstances? Could I come up with a different sort of weapon that wouldn’t work at long range (but also didn’t just pop out of nowhere)? Walking to work, I thought about it. Lying in bed trying to sleep, I thought about it. Nothing. Whatever I came up with, however I tried to spin it, I couldn’t come up with any way to gracefully show it to my audience. Sure, I could decide the wand didn’t work at long range, but then I’d have to find a way to explain that to the reader, and that just felt stupid. Awkward and inelegant. I had no idea how to accomplish this. I sat down in front of the blank screen and started typing (sometimes that works better than thinking for me). And suddenly I wasn’t typing stuff about my heroes, but rather about the villain. And I realised how WRONG the GM-based point of view had been. I realised that I’d allowed my GM brain to limit my approach to the problem, without my even recognizing it. I’d actually been worrying about how to explain things to my HEROES, not my audience. In my GM brain, they’re the same thing, and I had totally overlooked this false equivalency when writing. Writing from the villain’s point of view, it was easy to explain to the audience why the villain didn’t use his weapon until it was too late, because I could just SHOW them. So I did, and it worked. Captain Li is not the most cheerful woman on the seas. But her crew loves her. My brand-new serial adventure, THE SEVENTEEN EYES OF JUSTICE, has just launched, with four episodes ready for you to download today! I thought I’d introduce you to the hero of this ongoing tale: Captain Li! Captain Li Ying is a woman in trouble. Captain and owner of the disreputable, and HAUNTED BY DEMONS, cargo ship Seeker, she needs to find a new evil soul every few weeks, or else the seventeen demons – the EYES OF JUSTICE – bound into the ship will be freed to enact their idea of JUSTICE on the world. It’s not her fault. She inherited the ship from her father upon his death, and all she knows is what he told her, and that wasn’t very much. She knows how to keep the demons satisfied, but she doesn’t know where they came from or what they really are. So she sails from port to port amongst the tropical islands of the DINO-PIRATE seas, looking for jobs to keep her ship afloat, and bad, bad people to turn over to the waiting Eyes of Justice. When we first meet Li (as she’s mostly called, “Ying” to close friends like her lifelong first mate, Anarayat), she’s trying to find a new evil soul she can hand over to the Eyes. This isn’t a straightforward process at the best of times. The Eyes have proven discerning in their taste for evil and if she hands them someone they don’t consider “tasty” enough they are not satisfied. Which means Li suffers, and the Eyes are that much closer to escaping the prison of her ship. And of course, evil people, by their nature, are kind of hard to just TALK into coming aboard her ship for a three-hour tour, so Li needs to get creative from time to time. It’s that creativity that earns our first episode its cheerful title, “Ending in Tragedy”. Her life is a tough one. Tracking down evil people is certainly a dangerous sort of hobby, and when the Eyes get hungry they can take it out on Li, so she doesn’t have much time for a personal life. She does her best to look after her sort of loony crew, but what she really needs is a way to deal with the Eyes of Justice once and for all. In order to do that, she’ll have to somehow get her father’s old logbooks back from the man who has them — the slippery self-styled Lord Evanisk of Seagaard, who always hated her father and only wants the power of the Eyes for himself. And Evanisk has no intention of handing them over, not unless Li dances to his sadistic tune. As if all this wasn’t complicated enough, Li finds herself falling kind of hard for the handsome, well-dressed scholar Lord Evanisk has put to watch over her. Arunza is everything she’s not: elegant, educated and effortlessly graceful. Having him around is no end of distracting for Captain Li, even though she knows he’s working for her hated enemy. Captain Li can’t keep going on the way things are. The Eyes of Justice are after her soul, and sacrificing people, even terrible people, is no picnic. Her only hope is to somehow hope she can trust the charming Arunza long enough to steal her father’s notes back from Lord Evanisk, and that somewhere in those scribbled pages lies the clue to sending away the Eyes forever. You can buy the first seven episodes of THE 17 EYES OF JUSTICE right here on this site, or grab them for your Kindle on Amazon! 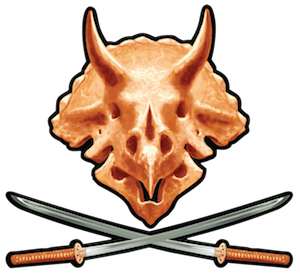 Enter your email address and get prehistoric swashbuckling kung-fu adventure right in your inbox! Don't worry, I'm not going to do anything dumb or horrible with your email address. Promise. Announcing The 17 Eyes of Justice! Free DINO-PIRATES OF NINJA ISLAND Adventure! Prepare an Awesome DINO-PIRATES Adventure! Location and NPC Sheets for DINO-PIRATES! Looking for more? Browse around! Unless otherwise posted, all everything on this site is copyright Corey Reid. But check with him if you want to use something, he's usually pretty cool that way.